Understanding the performance of your Google AdWords account can be difficult. There are so many options and advanced settings that you can change in AdWords, and each change can have a significant impact on your account. It can be easy to get lost in all the options, and if you want to improve your PPC performance then you should start with the basic information first before you proceed to other data points. Click Through Rate (CTR) is a basic metric that you can look to understand the performance of your account. This metric can help you understand the quality of your keywords, the strategy that you have for targeting your audience, and the value of your ad copy. While CTR is not the ultimate metric to consider, you should first look at CTR if you want to discover ideas to improve your PPC campaigns. Let’s take a look at the basic components of CTR, and how you can tell a story about your AdWords campaigns based on this metric. What Are Impressions In Google AdWords? The first thing to understand when it comes to AdWords performance is the metric of Impressions. An impression in AdWords occurs when a user searches for one or more of your keywords, and Google displays one of your ads. You can increase the number of Impressions for your account by conducting great AdWords keyword research. This means that an Impression indicates how many times one of your ads appear in the Google network. Impressions are one of the most basic parts of understanding the performance of your AdWords campaigns because Impressions tell you the reach of your ads. Since Impressions tell you the frequency that your ads appear, you can begin to understand the quality of your keywords, ads, and targeting strategy. It is important to note that since Impressions only indicate how often your ads have appeared, the Impressions metric only tells you that your audience has seen one of your ads. The information and insights that we gather from Impressions are based solely on keywords and ads, and this metric has nothing to do with landing pages or your website alone. This metric is not very helpful, but you can use Impressions to understand the context and tell a story about your AdWords campaign. Understanding and using Impressions in your AdWords campaign can help you optimize your account because this metric shows you the reach and frequency that your ads are showing the keywords that you were using. What Are Clicks In Google AdWords? The second part to understand the quality of your AdWords campaign through CTR is by incorporating Clicks. While Impressions tells you the reach of your AdWords marketing campaign, Clicks tell you how often your audience engages with your ads. This is the second piece of the CTR equation, and with this metric, you are well on your way to uncovering your account performance using CTR. In AdWords, a Click as a metric that shows the number of times people interacted with your ads. Clicks can help you understand whether your ad copy is appealing and relevant. In general, great ads in AdWords are engaging, highly targeted and have compelling ad copy are more likely to receive more clicks. It is important to note that there can be a difference between clicks and website visits that you see in Google Analytics. This is because a Click will still be recorded even if your site is temporarily unavailable or other issues prevent your audience from your website. On their own Clicks do not offer much meaning, but when combined with Impressions, you can understand the context of your ads through Click Through Rate. Here are a few things to consider if your campaigns and ad groups are not receiving an adequate number of Clicks. If you find that your campaigns are receiving a low number of Clicks, then you should check your Impressions to see if low engagement is being caused by limited reach. If you have a budget that is too low, then your ads might not show. If you have lots of Impressions and Clicks, then your ad copy likely does not speak to the needs of your audience. Optimize your keywords, geotargeting budget and ad copy to increase the number of Clicks your ads received. Now that we have discussed Impressions and Clicks, we should take a look at how to interpret CTR for our campaigns and ads. CTR is one of the most powerful metrics that you can use to troubleshoot account performance, and you can leverage insight from CTR to develop a more profitable Google AdWords management strategy. What Should You Know About Click Through Rate? Click Through Rate is a metric in AdWords that shows the relationship between how often your ad appears and the number of times your audience clicks on your ad. This metric is the result of looking at how many times your ad appeared (Impression) and how many times your audience engaged with your ads (Clicks). Since this is a ratio, you will be able to determine how well you are targeting your key audience and how compelling your ad copy is to your ideal customer. You can look at the CTR as a way to understand how valuable your ad copy is to your keywords, and how effective targeting factors are performing in your campaign. You can assume that an individual will only click on an ad that is relevant and meets their expectations. If your ads have high impressions and low clicks, then you can conclude that your ads are not relevant to the needs of your audience. If you have a low CTR, then you should consider ways to make your keywords more targeted and ad copy more cohesive. At the same time, make sure that your ad copy stands out from your competition and meets the needs of your audience. You can use different extensions with your Google Ads to boost CTRs and help drive qualified traffic to your site. Review your campaign’s negative keywords and Search Terms in the AdWords interface to optimize your CTR while also testing different ad copy. This approach will help ensure that you optimize the relationship between your keywords and ads around the needs that your readers have so that you can provide more valuable content in your ad copy. CTR is not directly related to sales and website performance, but from a technical level, you can use CTR to identify opportunities to improve your account performance. Once you begin to find ways to improve the performance of your campaigns you can start to look at ways to improve conversions. Use CTR as a benchmark to identify low hanging fruit in your AdWords campaigns that you can improve to get your ads found more often by your target audience, and drive more qualified traffic by crafting great ad copy. How Can You Improve Click Through Rate Performance? 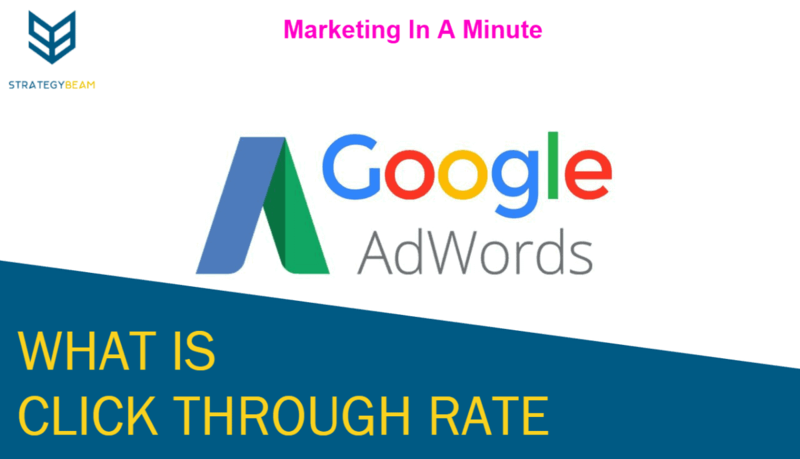 Click Through Rate is one of the most important metrics in AdWords. This metric indicates how well your keywords are optimized, how compelling your ad copy is, and the overall health of your AdWords campaign. Since CTR plays a major role to troubleshoot and improve your Google AdWords campaigns, you should also understand how you can improve CTR. The only way to improve testing and enhance your keywords, audience targeting, and ad copy is to know how to increase Click Through Rate. If your campaign is suffering from low CTR, then you can consider these five ways to improve the strength of your ad campaigns. Avoid using broad match keywords. These keywords can trigger ads for several search terms that do not align with your user intent. Use keywords from your ad group in your ad copy. This will help Google understand your ads and connect your audience with the intent of the ad copy. Use keywords in the display URL and Paths. This will help build credibility as your audience reads the ad copy and will improve engagement. Use symbols and numbers in headlines and ad copy. This will help you stand out from your competition and grab the attention of your audience. Optimize negative keywords. It is important to tell Google what your ads are, not just as much as it is to optimize keywords to get shown. Take Charge Of Your Google AdWords Campaign Today! As you look for ways to boost the performance of your Google AdWords campaign, you should be sure to check the basic metrics first. While there are many options in AdWords that all can have an impact on your account, you should start with the simple answers first. Use CTR as a benchmark to optimize your keywords and create valuable ad copy today!